“This event was an opportunity for us to start having those hard conversations about gender relations and men’s sexualized violence against women,” said Vice Chancellor for Student Affairs Jeffrey Waple, PhD. Waple led the walk from the Morris University Center and around a section of the SIUE campus. The men ended their high-heeled trek at the SIUE Cougar Statue. “Our goal was for men to appreciate women’s experiences, thus changing perspectives which will help to improve gender relationships and decrease the potential for this type of violence,” said Waple. PEACe facilitated the walk in collaboration with the SIUE Campus Activities Board (CAB). 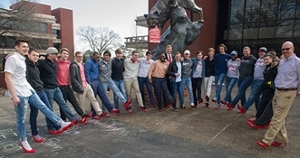 A group of male SIUE students, staff and faculty participated in the University’s annual Walk a Mile in Her Shoes activity on Tuesday to bring attention to sexual violence against women. Shown in the center is Jeffrey Waple, PhD, SIUE vice chancellor for Student Affairs, who led the march.